Central State University in Wilberforce, Ohio, is one of the nation's oldest historically black universities, with a 125-year legacy of academic and athletic achievements. The College of Business, the College of Education, the College of Humanities, Arts, and Social Sciences, and the College of Science and Engineering which includes the Departments of Manufacturing Engineering and Water Resource Management, form the core of the University̠s varied academic offerings. 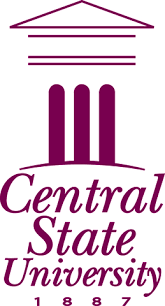 The CSU Institute for Urban Education (IUE) builds on Central State̠s roots as a center of excellence for teacher education. It also reflects the College of Education̠s emphasis on preparing teachers for work in today̠s urban classrooms. Housed in the newly constructed Center for Education and Natural Sciences (CENS), the IUE serves as a national resource center for the training of urban teachers and the exchange of scholarship on urban education issues. A newly developed program in environmental engineering builds on CSU̠s signature Water Resource Management Program, and a new major in criminal justice will further expand career opportunities for Central State University students.